The traditional bass recorder is straight and sounded by blowing through a pipe. Some players call this pipe a 'bocal' which is the term used for the very similar part of a bassoon, and smaller pipes used with the cor anglais and baroque oboes. I don't agree with this choice of word as on the recorder the function is different. It only supplies the air. It does not form part of the sounding air column. Lets keep things simple and unpretentious by just referring to it as a 'pipe'. Because the function of the pipe is only to supply the air, it has no influence on the tone quality of the recorder. It does, however, alter the way in which the recorder responds to the player in subtle ways. Fortunately, it is not a critical part of the recorder. The pipe is often lost. New pipes are very costly but there are other ways of blowing the bass recorder and improvisation is a surprisingly good way to overcome a missing pipe. The 'knick' style head is a relatively new (mid C20) style. The angles vary (larger bends favour smaller players) and there are many advantages. The angle does not affect the sound. The player has a good view and the recorder responds quickly to the breath. Most are made of moulded plastic but wooden models have been produced for a long time. Some had metal angle parts. The configuration is also applied to big bass recorders. With wooden recorders the head is made in the usual way, then cut at an angle (half the desired bend angle). One part is turned through 180o and the two parts are then glued back together. With plastic models the bend is a short separate unit, very like a plumbing joint! The top of pipe blown bases is removeable and Aulos produce an alternative 'direct blow' cap. This has to be fitted so that the air goes straight from the slot in the edge, through which the player blows, down into the windway. The head has to be fitted to the body so that the window is towards the player. This makes very little difference to the sound heard by an audience but does help the player to hear himself, which can be an advantage. It is generally only possible for an adult to play a bass recorder this way. The lowest holes require a long reach. Early basses (and tenors) were (and are) often made to be played this way round. 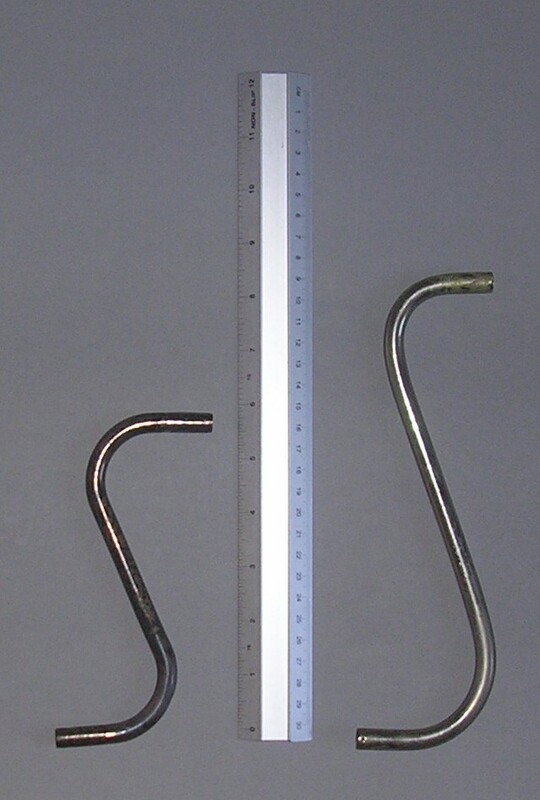 Bent pipes have always been difficult and expensive to make. This old model Aulos bass (and its predesessors) has the pipe entering from the side. This style is now much less common than it was. 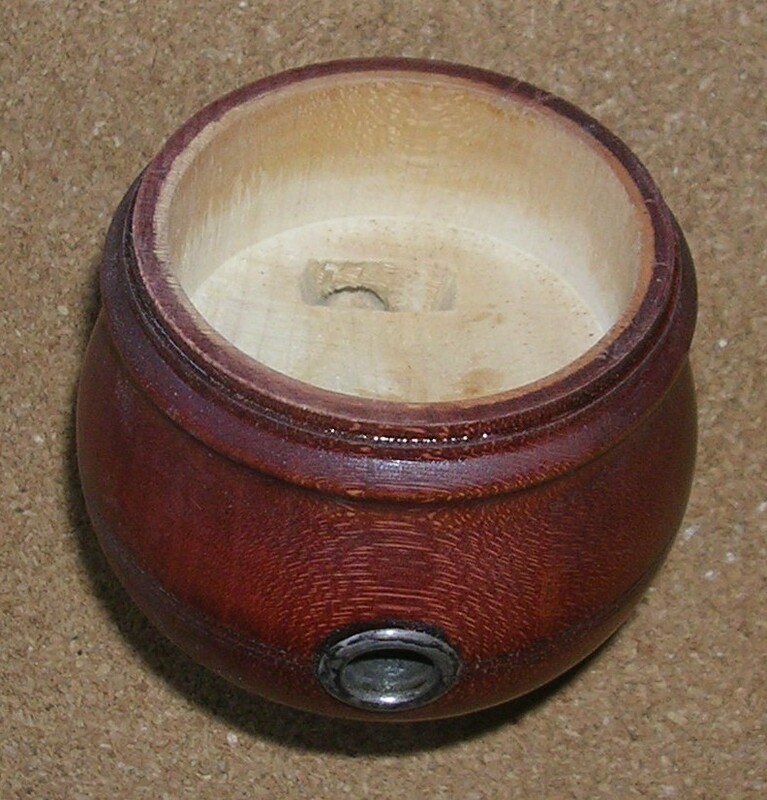 While the pipe must be easier to produce, the cap, whether of plastic or wood, is more difficult to make. If you are an adult, and need to play a bass lacking a side entry pipe, a short straight one will do. You could even use part of an old felt tipped pen! This one has my first, and rather plain, custom made wooden beak. Many players simply remove the cap, turn the head so that the window faces them, and hang their upper lip over the windway slot. Very good capless direct blown basses were made by Roessler. A pipe was never an option. 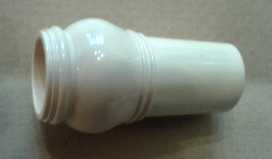 The head is shaped for direct blowing. This one is a superior boxwood 'Meister' model with imitation ivory ornamentation. The device at the bottom of the 'U' bend is a drain valve (very prone to complete seizure). 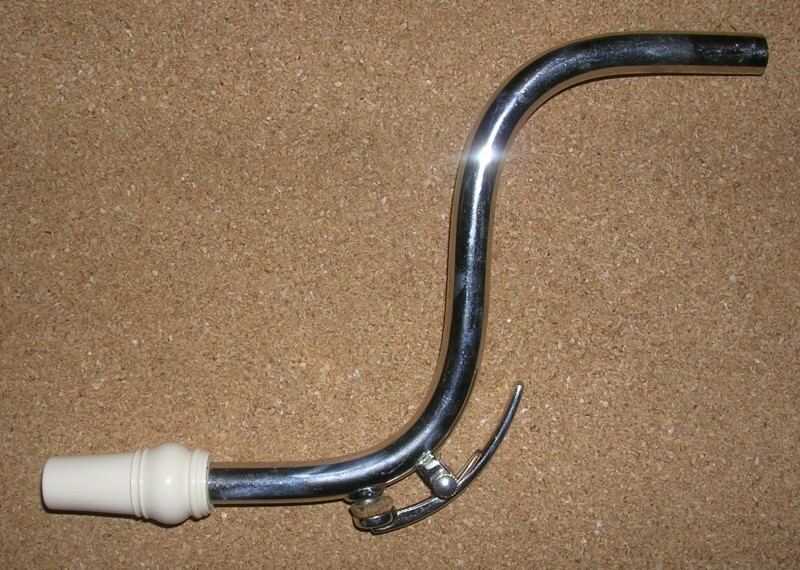 The black tube is the mouth piece (usually known as a 'beak'). Replacement pipes for the Moeck 'Tuju' model bass are no longer available. I made this one from plumbing fittings. The beak is original. The Aulos beak is available as a spare. A liner of synthetic cork solves all fitting problems. The latest production includes a resilient insert that makes the fit less critical and ensures a complete airtight seal to a nominal 12mm pipe. Click the image for a full size view. The Aulos beak is an ideal replacement for lost or broken beaks. This old German pipe has a conventional drain key. Pipes vary in length. Longer ones are needed for small players (children). The two illustrated here are roughly 14cm. and 21.5cm. long. 12mm. is now the most common diameter, 10mm. and imperial sizes may also be found. Some instruments have a metal sleeve in the head to accept the pipe. (Sometimes this is lost, with the pipe.) It is generally possible to overcome sizing problems by lapping the pipe, or fitting a sleeve into the hole. Cork, natural or synthetic is suitable. This old, German, cap still has its 12mm. sleeve for the pipe. 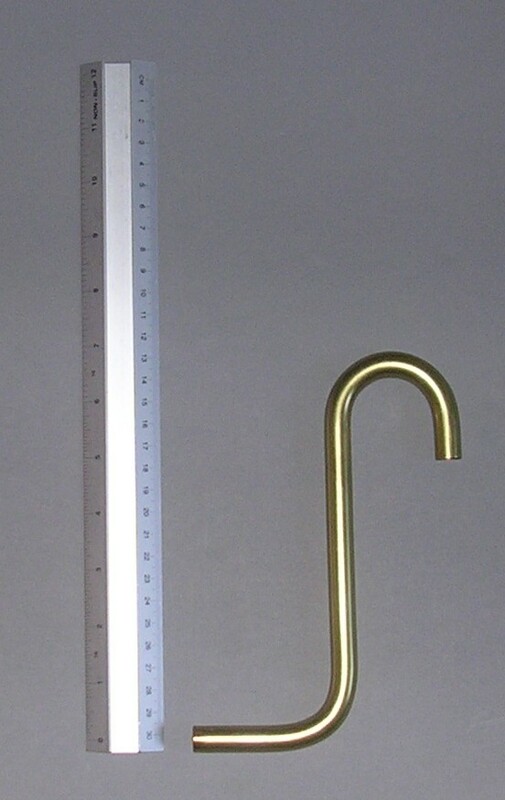 This is a top fitting pipe from Mollenhauer, for their 'Denner' bass recorder. All the bends are in the same plane and it lies flat. Some (Aulos, for example) have a twist in the 'U' bend that offsets the beak from the line of the recorder. This goes some way to unblocking the player's view of the music (and, perhaps, the conductor). Look closely at the first image on this page. Click the image for a pdf showing how I effected a good looking conversion of a side entry Aulos cap to top entry. Never try to bend a bass pipe without specialist tools. You will ruin it by kinking it. The Double Hole Key for Hole IV. This is a feature of older German made Bass Recorders. There are quite a lot of these recorders about but I have only just found one in good enough condition to work out how to make best use of this feature. The bass is an old 'Dulcia' model from Roessler and was probably made in the 1970's. I suspect that these fingerings may also work for 'German' fingered instruments. I have used 0 for the thumb hole and IV- for the hole IV extension. These are all good strong notes and the fingerings are also useful for trills. Their use is not obligatory and treating the hole in the key as a standard hole gives satisfactory results, though with the usual weak forked fingerings.